Reindeer Treats Stocking Stuffers. 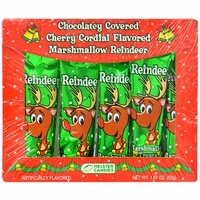 Chocolate covered cherry cordial flavored marshmallow reindeer's. 6 individually wrapped reindeer treats per box. You can't go wrong with these stocking stuffers. Milk chocolate, cherry cordial flavoring and marshmallow.